New Paper Accepted for Publication: Mindfulness Training Targets Neurocognitive Mechanisms of Addiction at the Attention-Appraisal-Emotion Interface - Eric L. Garland, Ph.D.
My colleagues Brett Froeliger, Matthew Howard, and I recently authored an invited conceptual review paper (FREE TO DOWNLOAD) for a special issue of Frontiers in Psychiatry: Addictive Disorders and Behavioral Dyscontrol. Prominent neuroscience models suggest that addictive behavior occurs when environmental stressors and drug-relevant cues activate a cycle of cognitive, affective, and psychophysiological mechanisms, including dysregulated interactions between bottom-up and top-down neural processes, that compel the user to seek out and use drugs. Mindfulness-based interventions (MBIs) target pathogenic mechanisms of the risk chain linking stress and addiction. This review describes how MBIs may target neurocognitive mechanisms of addiction at the attention-appraisal-emotion interface. 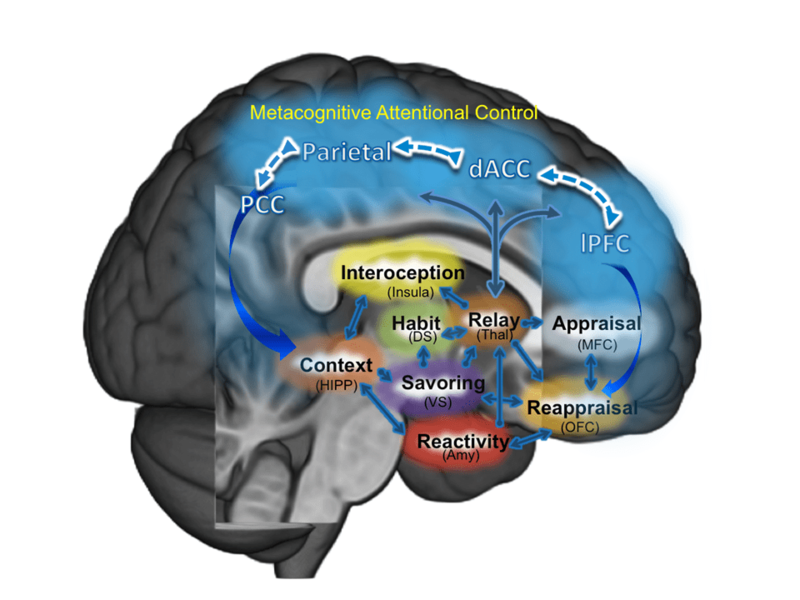 Empirical evidence is presented suggesting that MBIs ameliorate addiction by enhancing cognitive regulation of a number of key processes, including: clarifying cognitive appraisal and modulating negative emotions to reduce perseverative cognition and emotional arousal; enhancing metacognitive awareness to regulate drug-use action schema and decrease addiction attentional bias; promoting extinction learning to uncouple drug-use triggers from conditioned appetitive responses; reducing cue-reactivity and increasing cognitive control over craving; attenuating physiological stress reactivity through parasympathetic activation; and increasing savoring to restore natural reward processing. Treatment and research implications of our neurocognitive framework are presented. We conclude by offering a temporally sequenced description of neurocognitive processes targeted by MBIs through a hypothetical case study. Our neurocognitive framework has implications for the optimization of addiction treatment with MBIs. The conceptual framework outlined in this paper clarifies and contextualizes the recent results from our randomized controlled trial of Mindfulness-Oriented Recovery Enhancement as a treatment for prescription opioid misuse and chronic pain. trulyy ppeaked mmy interest. I’m going tto bookmark your site and keep checking for new information abgout once per week. you have any recommendations, please let me know. Thanks a lot!